As a Pilates teacher I can pick favorites- and no- I’m not talking about students. Some of these are scientifically proven to recruit more muscle fiber, some are classic pilates moves and some are just fun to me! Keep in mind if you want toned flat abs, most often nutrition is key. Abs really are made in the kitchen! What you eat can shape your body fat percentage- which effects how much we can see your abs. Genetics will play a major factor here… if you are naturally lean it will be easier for abs to show through. Your genes determine if you store fat in your abdomen or not- and those of us who do - well you can just say thanks to Mom and Dad! And if it’s that the of the month, ladies -bloating can be normal but fear not! Pilates has your back and from! 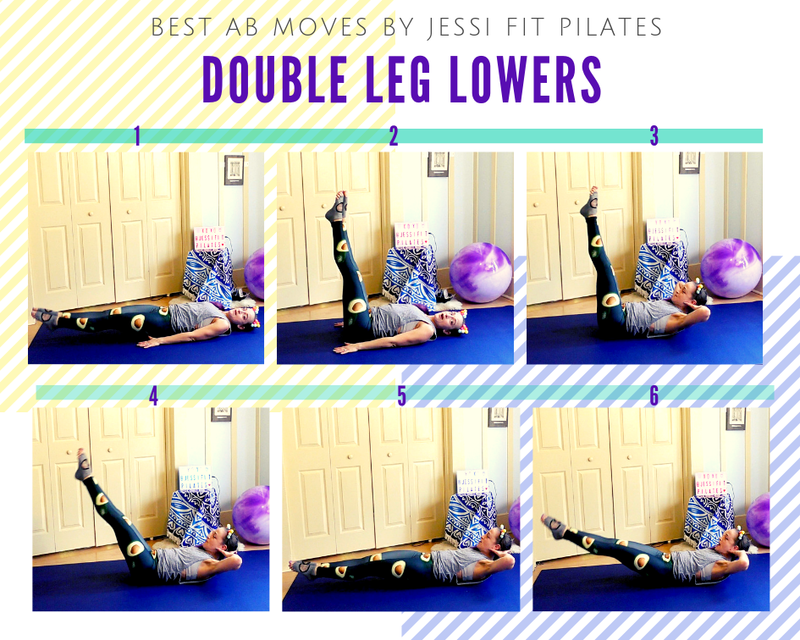 Regardless of genes- I firmly believe that Pilates will really help to make your abs seem slimmer since we work on hollowing or bracing our abs. Plus keeping your core strong is good for your overall health and can help in sports performance and prevent injuries We won’t be just crunching- since your abs support your spine and its movements- we’ll be working our torsos in different directions! 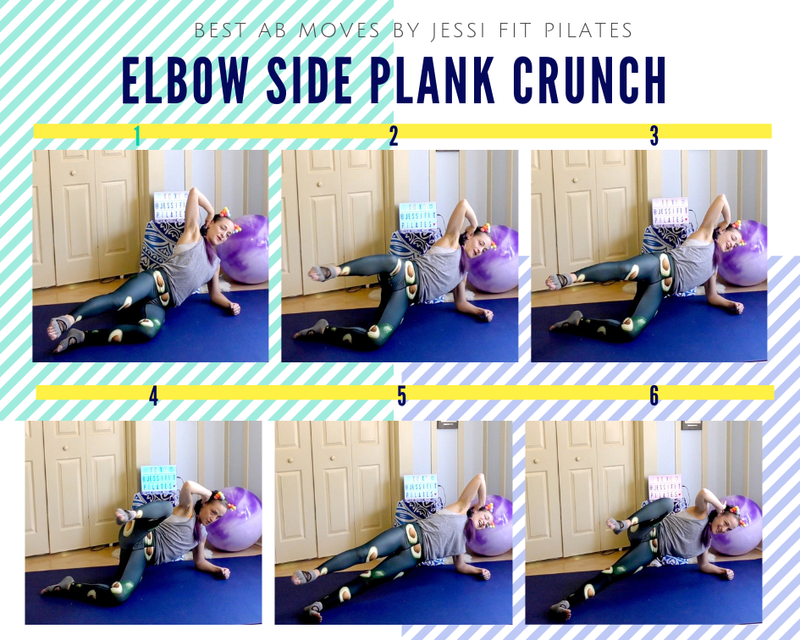 Feel free to scroll down to see the full video or check the graphics and instructions for each of my favorite home ab and core strengthening exercises! Twist hips to right as you exhale. Come back to elbow plank & inhale. Twist left. Keep alternating for 5-10 each side. Inhale as you return your torso to center and bring both knees to their starting positions. Repeat for 5-10 each side. Lay back and imprint spine to mat. Legs reach up to ceiling. Curl head up to chest & pull belly muscles in. Keep low back very still & gently pressing long to mat. If you know me you just know this is my all time number one favorite! WORKING ON: Strengthens and stretches the abs, core, spine hips and neck. Stretches the legs, and back. Increases abdominal control and coordination. Reach hands to ceiling then lift chin up as you & reach to toes, keeping shoulders soft. Slightly lower arms and roll your spine one vertebra to the mat keeping tailbone rounded forward and legs at 45. Click the button to try my 5 day FREE core workout challenge!